Puzzled about how to transfer songs from iPhone to Mac? Suprisingly, you can use MacX MediaTrans to copy music from iPhone to Mac (MacBook/iMac) with impressive speed. I haven't used iTunes in years and nothing on my iTunes account. All songs I have are stored solely on my iPhone. Can I use iTunes to copy music from iPhone to Mac, or is there a third party app can help me solve the problem of "How to transfer songs from iPhone to Mac"? When syncing with iTunes, you may lose some existing music files on your iPhone like music that downloaded from website or purchased from somewhere other than iTunes. It is quite clear that iTunes only allows users to sync songs purchased from iTunes. If you want to copy other songs from iPhone to Mac, you need iTunes alternative - iPhone music transfer. When referring to how to transfer a song from iPhone to Mac, most of you may think of iTunes or other popular apps like iTools, iFunbox and more. But, some of them can't find the music files and others can't allow you to sync all songs to Mac. What's worse, some of them can't run on Mac operating system. 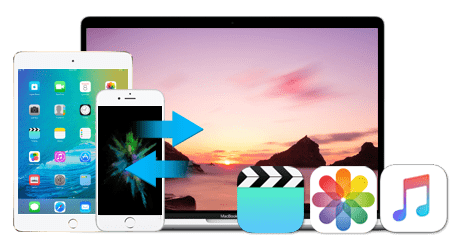 To successfully transfer music from iPhone to Mac, you can rely on a full-way MacX MediaTrans which allows you to move music from iPhone to Mac (MacBook Pro/Air & iMac 4K/5K) without any loss on original music files. Superfast speed and no quality loss. In addition to music, it also supports syncing ringtones, voice memos and more audio files from iPhone to Mac. Before you start, you need download MacX MediaTrans on your Mac OS X (macOS Sierra/El Capitan included) at first. Step 1: Run iPhone music transfer on your Mac and then connect your iPhone to computer with a USB cable. Step 2: On the Homepage of MacX MediaTrans, click "Music Manager" button to enter the music management interface. Step 3: Select the target songs and then click "Export" button to copy music from iPhone to computer. 1. All the information of songs covering album, duration, artists, size will show on the center panel of iPhone to Mac music transfer and it supports auto-searching music songs by album, artist, genre and type. 2. In addition to tackle the problem of "how to import music from iPhone to Mac," this guide also can be applied to export songs from iPad/iPod to Mac computer and vice versa with super fast speed. 3. Certainly, you can use iPhone music manager app to export playlist from iPhone to Mac, sync music to iPhone, delete music from iPhone, rebuild entire playlists, edit the music information and more. 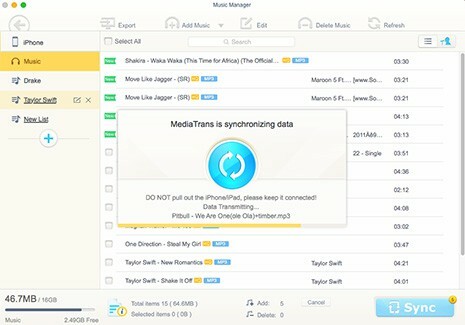 Last but not the least, this iOS music transfer app still supports transferring videos from iPhone iPod iPad to Mac and vice versa; copying photos from iPhone iPod iPad to Mac with superfast speed; mounting iPhone as flash drive to store music, videos, photos, Word, Excel files and more files. Best iPhone Music Manager to batch transfer songs from iPhone to Mac or vice versa, transfer playlist from Mac to iPhone, delete songs or create playlist on iPhone, etc.